As with any type of service provision, there are benefits and challenges to consider when planning to deliver tele-intervention services for children with hearing loss and their families. Although TI offers numerous benefits to families, implementation of this method in specific situations can be challenging. The learning community identified the following benefits and challenges they have experienced when implementing TI. Although the benefits of early intervention for children who are DHH have been demonstrated, many of these children are still not receiving appropriate services (CDC, 2008). Experts agree on the reasons for this problem (Sass-Lehrer & Bodner-Johnson, 2003; White, 2007). 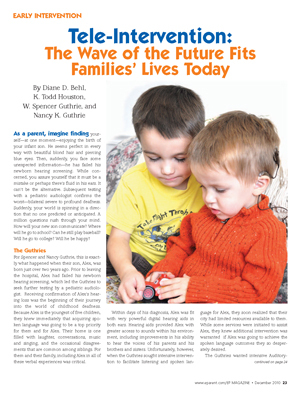 There is currently a severe shortage of early childhood professionals with adequate knowledge and training in current methods to effectively educate today’s children who are diagnosed with hearing loss. In addition, there is often a lack of a “critical mass” of children who are DHH in a given geographic area. As a result, finding qualified providers to deliver early intervention services—including professionals sufficiently trained in a listening and spoken language approach—is difficult in many parts of the country. Listening and Spoken Language Specialists (LSLS), often in demand in remote and rural areas, have the opportunity to use TI to provide their specialized services to families who live outside of the area they traditionally serve. Early intervention services are often provided in the family’s home in keeping with Part C of IDEA’s emphasis on natural environments, which is defined as services provided in the home and in community settings in which children without disabilities participate (IDEA, 2004). However, travel-related expenses often consume a significant portion of a program’s budget. Program administrators are consistently challenged to identify the most cost-efficient ways to assign service providers and schedule home visits while providing the most appropriate early intervention services to children with hearing loss and their families. Implementation of TI often reduces direct travel expenses (e.g., mileage reimbursement) and professional time (e.g., hours in the car driving to a family’s home). Travel time between appointments can be significantly reduced, offering the potential for early interventionists to provide direct services to more children in the same amount of time. Another alternative option to home visits—having a family travel to a clinic—often places an added burden on the family and may not meet the requirements of the IFSP. In addition, the effects of inclement weather often result in cancelled sessions. This challenge is reduced with TI service delivery. Parents were asked, “What’s different about TI?”. Their comments reflect any good early intervention session; but they also suggest that the key elements of an early intervention session are strengthened by TI. Enhancing a family’s capacity to support their child’s development is a goal for Early Head Start (EHS: Administration Children and Families, 2004), and Part C programs (IDEA, 2004). A family’s capacity to support their child’s development is accomplished by increasing parent knowledge and improving parent-child interactions. Families can learn new skills to interact with their child through “coaching”. A coach (aka; the early interventionist) supports and encourages a parent as the parent learns and practices new strategies; the early interventionist provides ongoing feedback about the parent’s use of particular techniques (Kaiser & Hancock, 2003). Coaching is an important intervention model for all children in early intervention, and is a particularly important element in fostering listening and spoken language in children who are D/HH. When a session is conducted remotely, the parent becomes the primary – or exclusive – facilitator of the child’s communication and language. The provider, at the distant site, offers guidance, modeling, and feedback to the parent. Childhood illnesses, those of the child with hearing loss or siblings in the home, are common and often result in cancellation of a traditional home visit. Health-related cancellations may be reduced when the child has only a minor illness and can still participate in a family-centered intervention session delivered through TI. An added benefit is that TI allows a session to be conducted without exposing the early interventionist to illnesses. For children with chronic health conditions, TI can decrease exposure to others, which in turn, reduces the risk of health problems. Programs in the learning community report that cancellations were decreased for families participating in TI. Early intervention programs often rely on interpreters who speak the primary language of the family receiving the services when the early interventionist is not proficient in the home language. This service carries additional costs including travel expenses. 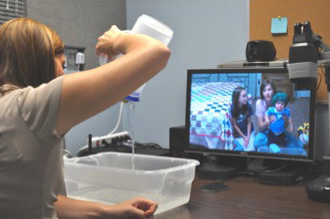 Using TI, an interpreter can participate remotely; the interpreter can be housed in the same location as the early interventionist, or the interpreter can participate from a different location using a three-way video connection. Although none of the learning community members have engaged interpreters via TI, the potential to facilitate access to interpreters is recognized. IDEA Part C regulations address the importance of EI services provided in a manner that reinforces the child’s "natural environment." TI supports the Seven Key Principles developed by the Workgroup on Principles and Practices in Natural Environments [PDF]. —Quote from caregiver receiving TI services. Early intervention services provided in the home are often provided with only one parent, extended family member or caregiver present while other significant adults are working outside of the home. TI offers the opportunity for all family members to benefit from the early intervention; the technology is available to record and store TI sessions. There are a variety of benefits to having a recorded session. The session can be shared with family members and other professionals on the intervention team. Family members who did not attend the session can benefit by learning from the strategies used in the session. All family members can observe the child’s progress from week to week. Video recordings of the TI sessions can be posted on a secure website for ongoing access. In addition to being instructional, the videos can be added to the family’s home video collection and can be shared with friends and other caregivers. It can be difficult to schedule meetings when several professionals, often from more than one agency, are involved. Joint visits are ideal but may be limited due to distance or scheduling. Professionals working with a child, including physicians, can join home visits via TI when scheduling is prohibitive. For example, a vision specialist could join the regularly scheduled home visit provided by the deaf educator via TI. Team members who may not be able to participate in IFSP meetings can connect via TI rather than missing the meeting or sending a designee. Taken together, these benefits provide more intensive early intervention services by expert providers using family-centered intervention principles. To learn more on the benefits and challenges of tele- intervention from the perspective of one of the learning community members, go to: A New Approach to Early Intervention: Virtual Home Visits [PDF]. Many families face practical constraints in attending group training opportunities. Families in rural areas are particularly challenged in their ability to meet in person with other parents of children who are DHH. TI technology can provide a way for families to join group sessions remotely, such as obtaining sign language instruction. and to connect one-on-one with other caregivers, providing a way to families obtain this important source of support. 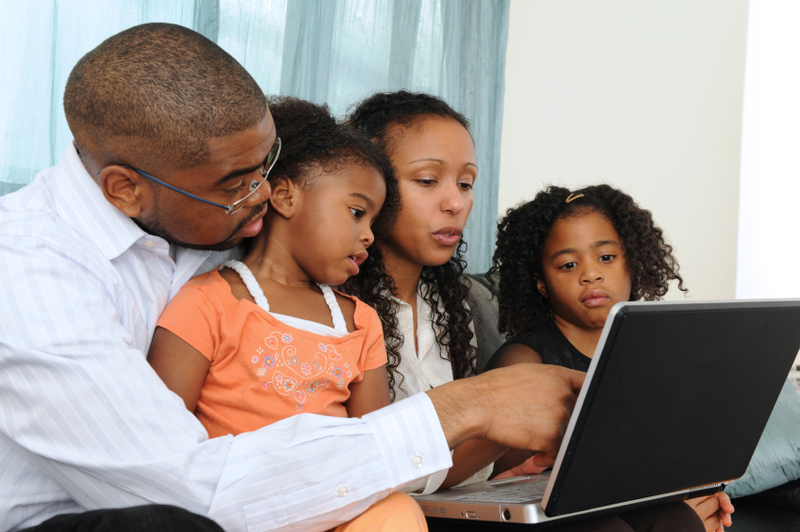 Some families are not confident using technology, regardless of the training they may receive, and this may influence their decision to participate in TI services. There are ways to simplify the technology; for instance, using a laptop computer with a built in microphone and speaker. Having a technical support staff person may ensure continued service when glitches do occur. A family needs to create a quiet space in the home for the TI session. Ideally, the space will have carpeting, good lighting, and a door that can be closed. In addition to having the training in providing high quality intervention, the early interventionist also must be comfortable using the hardware and software supporting TI and be able to trouble-shoot common problems (e.g., a lost connection, interference). The early interventionist has the task of facilitating activities to support the session’s objectives and attending, from time to time, to the operation of the technology. Providers, especially those who are just starting to provide family-centered intervention, may lack the confidence to focus on technology. The recommended skill set of the therapist is discussed in more detail in the next section. Some families may simply desire the support that only the physical presence of a provider can give. TI sessions can be combined with traditional home visits to meet the needs of individual children and families. It must be kept in mind that TI is one delivery platform for providing quality, family-centered services. Medicaid and Part C are two typical sources of payment for providing early intervention services. Additionally, some insurance providers may cover TI therapy services. Some states do not yet reimburse for TI. See Section VIII: Reimbursement Issues for TI.